The Laughing Cow has introduced a new product called Cheese Dippers. Cheese Dippers combines the Laughing Cow cheese with crunchy breadsticks for a portable snack. Bel Brands CMO Dan Water says in the announcement, "The release of Cheese Dippers ties perfectly into The Laughing Cow's current Reinvent Snacking campaign, which aims to bring mindful satisfaction to consumers' unique snacking experiences. 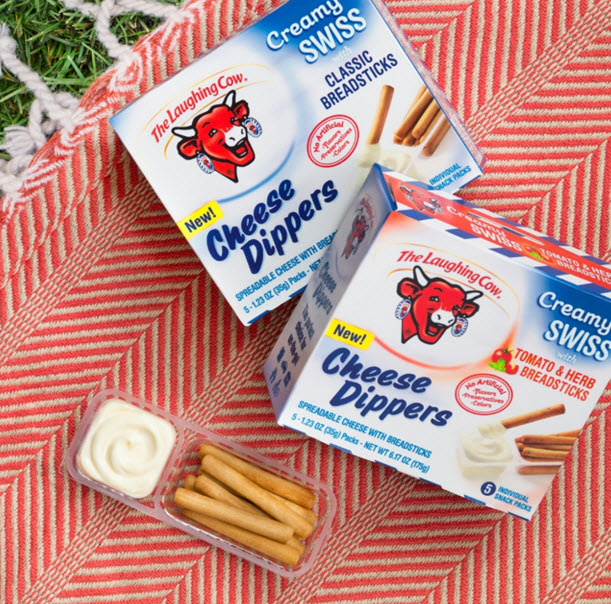 With its portability, Cheese Dippers gives our consumers the chance to snack adventurously." Cheese Dippers are currently rolling out in grocery stores nationwide and will reach nationwide distribution by May 2016. There are two flavors available: Creamy Swiss with Classic Breadsticks and Creamy Swiss with Tomato & Herb Breadsticks. The snack has 100 calories and 8 carbohydrates per serving size (1 pack). Cheese Dippers will be sold in single-serve packs for a suggested price of $1.49 and five pack boxes for $4.99.